Who is the Deep Blue of OFC? The Deep Blue of OFC is an AI named Warren. He plays almost perfect Open Face Chinese Poker after the 6th card. "Warren is the GTO bot of OFC"
"I would consider cross-booking sessions, taking Warren's side." 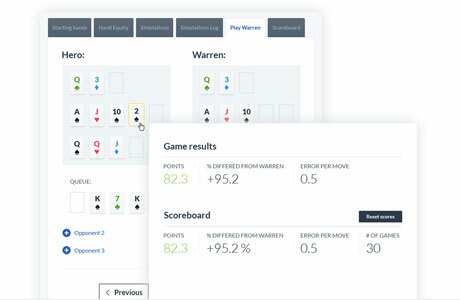 "Playing against Warren is a great way for novice players to learn." "I love the fact that I can play against Warren and he lets me know when I make a mistake and he shows me what the correct play is." "Thanks to Warren, I know exactly when to split my pair and go for a 3-card flush draw." Why is Warren so smart? Warren was built using advanced artificial neural networks. He trains and improves regularly and knows the perfect play for most situations. He's actually training hard at this very moment so don't be surprised if his play improves dramatically a few days from now. How does Warren fare against good players? Warren is currently really good and does well in matches against good players. But the scary part is as Warren continues to improve, it is unlikely a human can beat him over the long run. The more you play against Warren, the more you'll learn. What benefits do I get from PlayWarren.com? 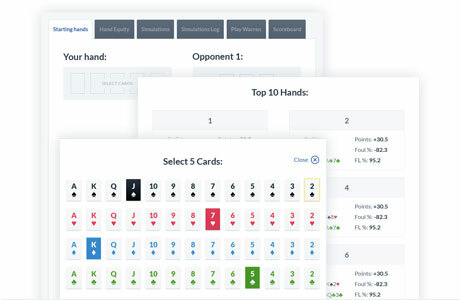 Learn how to play OFC as perfectly as a human possibly can. Learn how to set your initial 5 cards (with and without dead cards) … You'll no longer have to wonder if breaking a big pair for a 3 flush draw is the right play. Learn where to place the next card to maximize your equity against your opponents. This includes knowing the percentage of your hand getting to Fantasy Land and the percentage of fouling your hand. If Warren is so good, why are you licensing the AI instead of using it yourself? 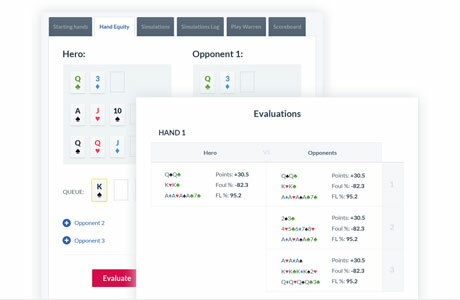 We are in the artificial intelligence business and we make money by licensing our software to help poker players. The more poker players improve, the more we earn. We have no interest in winning money from other poker players. It's also more fun for us to create cool AIs like Warren instead of playing poker. Why do you host PlayWarren.com on the cloud? Warren's brain improves every minute and we want you to have instant access to this improvement. We want you to have the most up-to-date software to prevent security holes that can compromise your poker accounts. 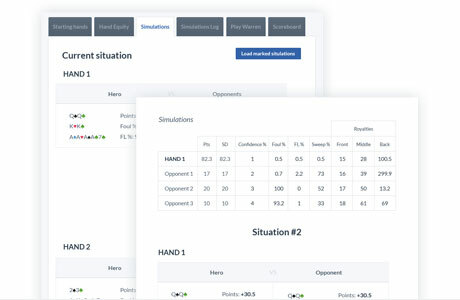 Hosting OFC Simulator on the cloud allows you to run it on multiple devices (PC/Mac/Mobile/Tablets) at supercomputer speed. Absolutely! You may upgrade/downgrades your license at any time. When upgrading your license, your previous payment can be used as credit for the new license. When downgrading your license, your previous payment can be used as credit for the new license and you'll get a prorated-refund.